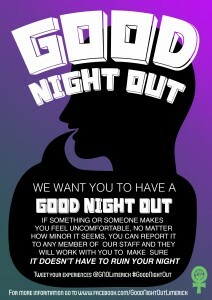 Originally the brainchild of Hollaback London – who are part of a of a global movement dedicated to ending street harassment – the Good Night Out Campaign was first launched in early 2014. The aim of the campaign is to build a zero-tolerance approach to harassment in pubs, bars and clubs. 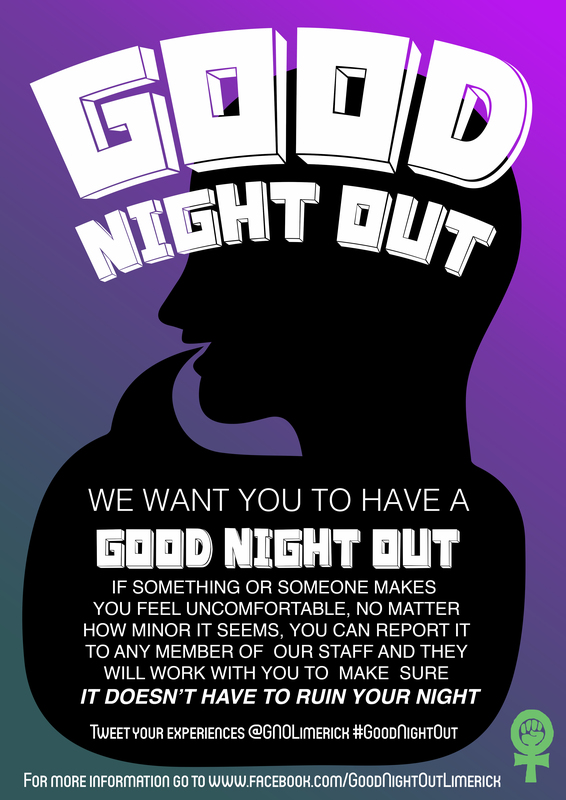 Due to the success and positive outcome of the campaign, Hollaback London wanted to re-launch Good Night Out as a separate campaign, in time for the new academic year and in a number of cities across Ireland and the UK. From here the Limerick Feminist Network brought the idea of Good Night Out to its members. It became clear that this campaign was something that Limerick needed. The safety of patrons in night life venues across the city should be paramount. With the support of a number of local organisations and educational institutions and the cooperation of Limerick’s most popular night life venues we hoped to make Limerick somewhere where everyone always has a Good Night Out! We asked venues to sign a pledge and publicly commit to the campaign by displaying GNO posters (below) notifying customers of their stance and to stamp out harassment in their premises. The campaign was launched in August 2014 to great reception, it was also given mention across a number of local news outlets. We hope to re-launch Good Night Out Limerick some time in 2016.